In retracing taco history, I noticed that in a book I wrote in the 1990s, I thought it necessary to explain the fish taco in some detail and convince readers that this could be a good dish. 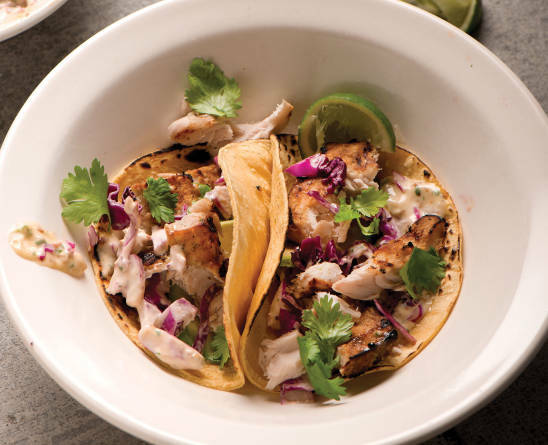 Whether grilled, fried, or sautéed, fish in a taco is sublime, especially when paired with cabbage relish and a creamy sauce. A more classic Mexican style, these tacos rely on soft fresh tortillas as a main ingredient. Prepare the marinade, pureeing the ingredients in a blender or food processor. Smear the fish with the marinade. Place in a large zippered plastic bag and refrigerate for 30–60 minutes. Don’t marinate any longer or the fish will become mushy. Fire up the grill, bringing the temperature to medium high. Mix the mayonnaise ingredients in a small bowl. Combine about 2 tablespoons of the mayonnaise in another bowl with the cabbage. Refrigerate the mayonnaise and the cabbage slaw, until needed. Drain the fish and spray on both sides with the oil. Arrange the fish on the grill and cook for 7–10 minutes, turning once. The fish is ready when the fillets flake easily and have some nicely browned edges. Arrange the fish on a platter and accompany with the tortillas, slaw, mayonnaise, and avocado slices. Let guests construct their own tacos with some of each ingredient, and enjoy right away.